Good morning! I wanted to play along in the MFT Sketch Challenge that Cindy posted yesterday. This is a REALLY old MFT stamp that I haven't used since 2008 (oh my! )...I really love it though and thought it would work well for the horizontal panel. I also wanted to use some new toys that I got at CHA....the cork and the small scallop die-namics! I stamped the tub twice, once on the Vintage Cream CS and once on the DP. The one from the DP was cut out and popped up on foam tape. I added some Stickles spraying out of the shower head and added some more on all the centers of the flowers on the paper pieced tub. Oh, and because the cork is thicker than regular paper, the left half of the main image is up on foam tape and then I glued down the right side (over the cork) with some regular Ad-tech glue. Oh how pretty Denise!! I just love the soft colors you used and the addition of the cork. I have never used cork on my creations before but you have inspired me to try it. This is gorgeous, Denise!! I love how you pieced that tub--it's one of my favorites! This is heaven Denise...so dainty and pretty! I love the paper, the scallop (which i must purchase, now) the image and how you paper pieced it! Heavenly! Duch a darling card...I love this image! So many uses for it! Great job! Oh! I have that stamp! This is SO beautiful Denise...sweet and feminine! GORGEOUS colors and papers and I love the cork accents!! Ooo I remember that stamp :)! So cute- love the stickles and the cork butterflies! I think that stamp is a classic that will never go out of style! I love how you worked cork into such a feminine card - it looks fabulous! I never could have imagined cork on anything but a guy card, but you proved me wrong! This is just beautiful!!!! Ohh Denise this is GORGEOUS! Well, thanks for nothing, Denise! Now I am KICKING myself for selling off my MFT images like that! booohoooo... I want it back! This is TOO cute! A perfect little Vintage bathtub! Very pretty, I really like the designer paper and the cork. That's funny that you used that stamp a few days ago I was going thru a pile of cards that I kept for ideas and I found one that you sent me with this image...it was in purple. Gorgeous girl! LOVE that image too! I haven't used it in a while so thank you for the inspiration to pull it out! I'm jealous you have the new scallop die already! haha! SUPER sweet! Love everything about it! YAY - I was with you when you bought the die and the cork paper! Aaah - memories! Such a lovely card! I love the cork! Gorgeous card Denise! Love how you added some dimension to the bathtub. Beautiful dp too. Love the cork and that pink ribbon - oh my, how PERFECT is that pink bow!! Sometimes I take longer fiddling with ribbons and bows than I take to make the rest of my card!! Ooh, I bought cork at CHA too and haven't used it. I'm not sure what to do with it. I never would have thought of cutting out butterflies with it. Thats really cool. Love the paper pieced tub. Such a neat card. Totally adorable, Denise!! 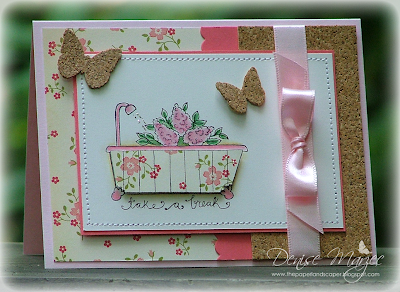 Love the cork butterflies and the paper pieced bathtub. Denise ~ such a delightful card. I got some of that cork several years ago and never used it. You made it look just wonderful on this card. And I love that stamp you used! This card is so pretty, in fact it's pretty gorgeous! too sweet. Love that cork!! Looks like you had a blast at CHA!!! I hope I get to go in the winter! I always loved these MFT images, so glad you dusted this one off! So pretty!! The cork is gorgeous!!! This is so pretty, love how you paper pieced the tub and love the cork. Now-as for this AMAZING card-I NEVER would have thought to do cork butterflies-LOVE them! *SIGH* This is soooooo beautiful!!! I just love these colours and the way you used the cork - the paper piecing is beautiful!!! Oh! How sweet! I just adore this! What a sweet little picture for a powder room! Do I have this stamp? My bathroom needs some sprucing!